After a decadent and leisurely brunch at Orsay, the last thing I wanted to touch was butter… but I bit the bullet for the sake of this post. 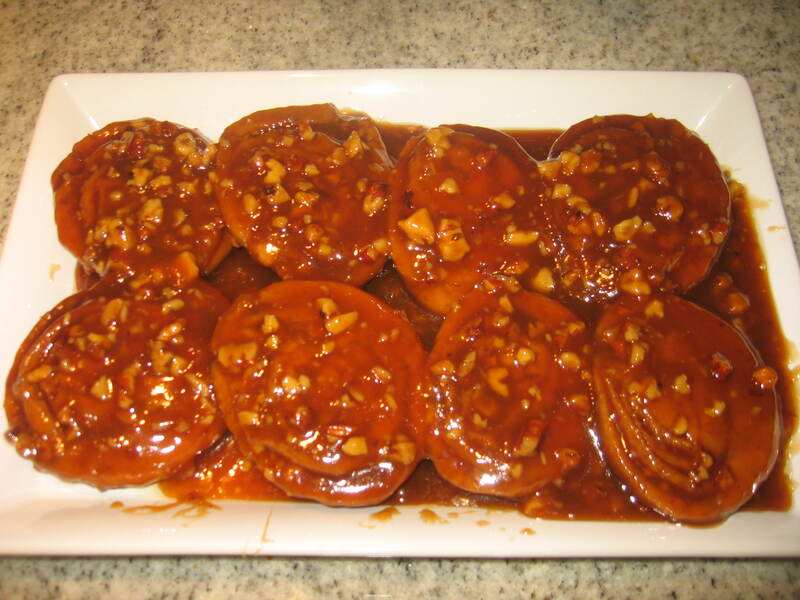 To me, one of the most butterylicious foods on the planet is a sticky bun. And not just ANY sticky bun: the glorious masterpieces that Joanne Chang creates at Flour Bakery in Boston. Joanne was kind enough to share her secret recipe with Food Network (after beating Bobby Flay in a sticky bun Throwdown) so I jumped at the opportunity. Not only are they coated in a heavenly sugary buttery “goo,” she uses a brioche dough for the buns themselves. What could be better? When I’m cooking or baking, I don’t usually pay attention to the caliber of butter I’m using. For the sake of this recipe I used a high-end French butter… and as foul as it is, I did a butter taste test before I began – I found the French butter had much better flavor than my usual choice, but I’m not convinced it would make much of a difference in cooking or baking; definitely a better choice to spread on toast, however. Melt the butter in a saucepan over medium heat. 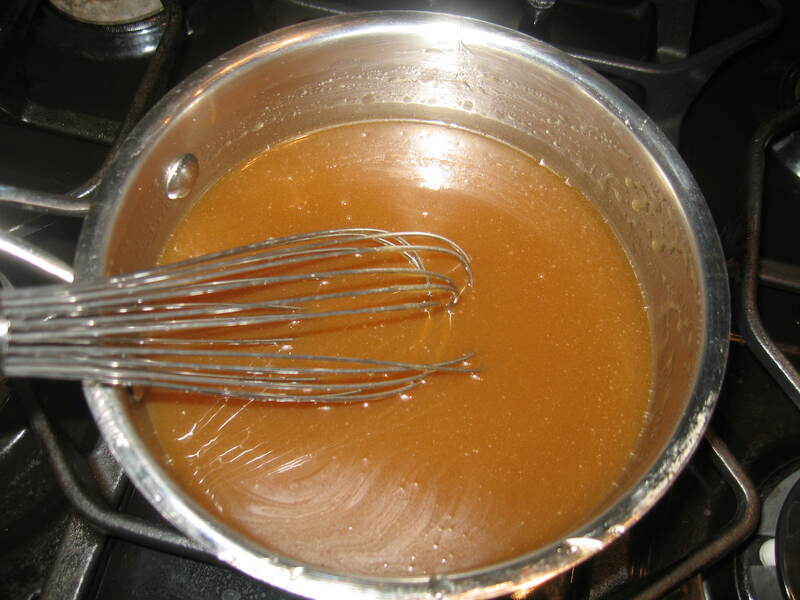 Add the brown sugar and whisk to combine (it is ok if it looks separated). Remove the saucepan from the heat and add the remaining ingredients. Cool to room temperature – about 30 minutes. The “Goo” can be stored in an airtight container in the refrigerator if you aren’t ready to use it. Although Joanne Chang recommends using a combination of bread flour and all-purpose flour, I used only all-purpose flour. Place all ingredients except the butter in the bowl of a food processor with the plastic blade (or an electric mixer with the dough hook attachment), beat until combined. 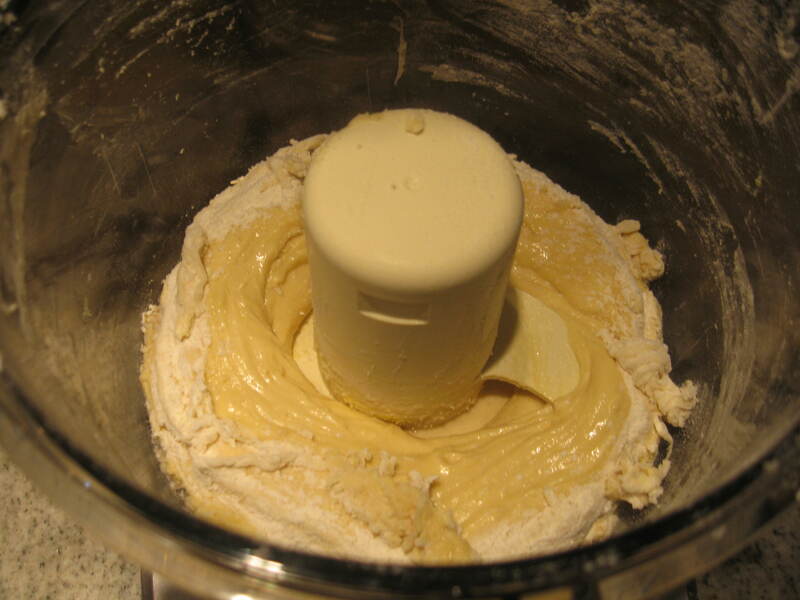 With the food processor or mixer running, add the butter, piece by piece, until the dough comes together and becomes shiny (this may take a while). Place the dough in a bowl and cover with plastic wrap directly on the surface of the dough. Refrigerate for 6 hours or overnight. Now for the finishing touch, the topping. Combine sugars, cinnamon, and ½ cup of the nuts in a small bowl. Then on a thoroughly floured board, roll out the brioche dough into a rectangle about 12” x 16” and ¼ inch thick. 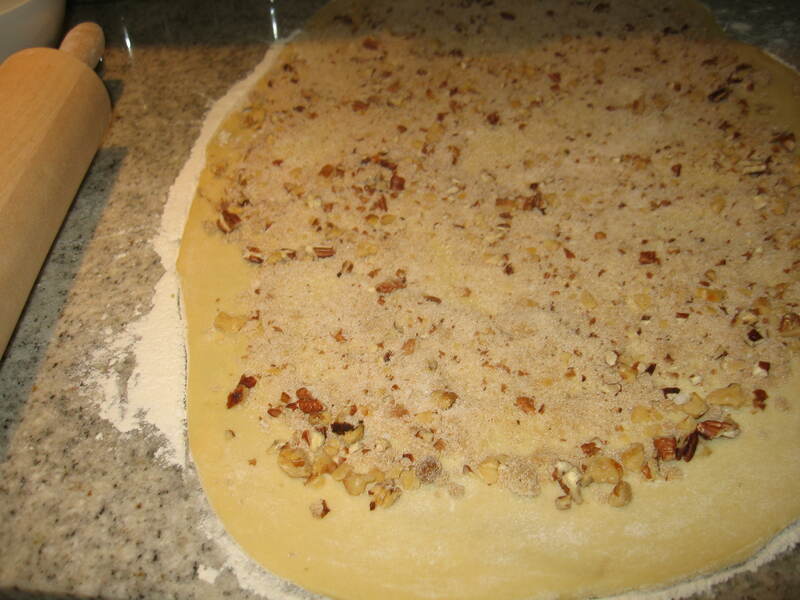 Sprinkle the sugar / nut mixture evenly over the surface of the dough, and then start tightly rolling it into a spiral starting from a shorter end of the rectangle. Cut off about ¼” from each side of the log to even it out, and then divide into 8 equal pieces. Pour the “goo” into a 9” x 13” baking pan and throw in the remaining nuts. Arrange the sticky buns evenly in the pan, let them rise for at least two hours, and then bake for 30-45 minutes at 350°. Allow them to cool for about 30 minutes, then turn them over individually onto a serving platter. Drizzle the remaining “goo” over the top. I wouldn’t recommend operating heavy machinery after eating one of these… or doing anything for that matter… and make sure there is a couch nearby. I will need at least a few hours to recover from the gooey richness of this sticky bun. I bow to your greatness, Joanne Chang. This entry was posted in Butter and tagged bake, brioche, butter, dough, flour bakery, Joanne Chang, sticky buns, sugar. Bookmark the permalink. 3 Responses to Sticky Buns. Are there any sticky buns left?!? gah i saw that ep! looks ahmaaaazing. and the blog is adorb, naturally.